The idea of television that originates on the Internet is still a new one. No matter how many Emmy nominations Netflix receives for House Of Cards, no matter how much critical acclaim for Orange Is The New Black, the very idea of pulling up a browser screen and plowing through a full season of TV is still an exotic one. And even looking beyond Netflix, Hulu, and Amazon—the behemoths in the Internet TV world—there’s YouTube, a place where anybody with a camcorder and a reasonably articulate script can come up with something that grabs the attention of a small (but ever-growing) audience. Programs like John and Hank Green’s Vlog Brothers, the weird drama Lonelygirl15, and the horror series Marble Hornets have earned followings as loyal as those for any TV series. And all of those references are years out of date. Internet TV evolves and mutates so quickly it’s often hard to pin down just what it is. There remains the lack of a critical apparatus to talk about web series, short of just applying the ones used when talking about TV to a very different, very young, format. To be sure, the offerings of Netflix, Hulu, and Amazon are TV shows produced for the Internet. But what about something like Husbands or The Guild, which both began as bite-sized chunks of content, then gradually morphed into something more TV-like but still very much uniquely of their medium? They occupy a poorly defined middle ground between “TV” and “web video,” and there are few—if any—attempts to approach them as something other than TV’s weird younger sibling. Web series seem to start out as some very low-budget collection of tiny morsels of content, and then gradually expand as budgets and ambitions grow. In some ways, it looks like what an independent TV scene could theoretically be. In other ways, it’s nothing like television. So much of this understanding of web video was already present in the works of Homestarrunner.com, the first online provider of TV-like content to see significant crossover success. At the height of the site’s cultural cachet—roughly 2002 to 2005—the programs it offered, particularly its popular Strong Bad Emails series, made appearances in mainstream press publications like Entertainment Weekly. They were referenced on Buffy The Vampire Slayer’s series finale. News of them spread far and wide on the Internet, mentions of Trogdor The Burninator and The Cheat turning into a kind of lingua franca of Internet cool for those in the know. They turned up in video games both on the series’ site and produced by other companies. And this was accomplished almost entirely without social media. There wasn’t a Facebook or Twitter when Homestarrunner.com started putting up videos, and those videos were encoded in Flash (a platform that paled in comparison as a delivery system to essentially any video player out right now). The success of the site was a minor miracle, but it also seemed self-evident to anyone who spent more than a few minutes clicking around through its content. The stuff on Homestarrunner.com was really funny, and even if the site hasn’t been updated in years, its surprisingly elaborate mythology and characters still pop up in online discussions from time to time. It also provided a blueprint for web TV going forward: Start small, then keep going. Homestar Runner began life as a children’s book, appropriate for how the web series that evolved from it rarely—if ever—trafficked in irony. 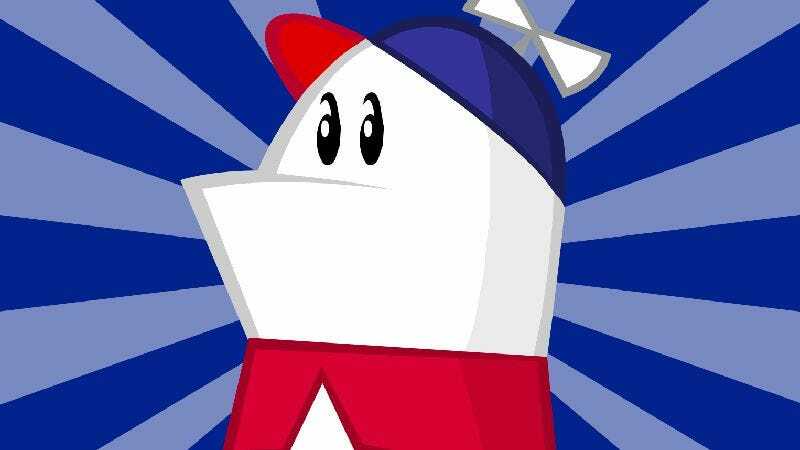 Created in 1996 by Mike Chapman and Craig Zobel (the latter of whom went on to direct films like Compliance), The Homestar Runner Enters The Strongest Man In The World Contest existed primarily as a goof that was handed out to friends and likely would have been forgotten by many. But toward that decade’s end, Chapman and his brother, Matt Chapman, began to get into Flash animation, seeing possibilities for how it could be used to create short Internet cartoons. Up until that point, web video largely consisted of low-production-value live-action series underwritten by corporate sponsors and the occasional dancing-baby oddity, but Flash provided a platform flexible enough to work on the rudimentary broadband and cable connections that were spreading throughout the country. (Most videos would even load without too much hassle on fast dial-up connections.) Looking for subjects for an online animated series, the two turned to the main characters of Mike Chapman and Zobel’s book—especially the dorkily earnest main character and his arch-nemesis, Strong Bad, who was perpetually clad in a Mexican wrestling mask and boxing gloves. Much of Homestar Runner’s animation is fairly rudimentary stuff. Arms go up and down. Mouths flap open. Characters stand in place while the background races past them to indicate movement. But all of that belies the program’s true strength: terrifically designed, perfectly written characters. The weirdos that populate Homestar’s world aren’t drawn from animated kids’ shows or even children’s books, but from another great American art form: the newspaper comic strip. As with Peanuts or Pogo, the characters may have hidden depths, but they’re largely defined by striking, singular personality traits. Homestar is the good guy, and even if he’s a bit of a nerd in the process, he’ll always return to that basic decency. Strong Bad proved too slippery for the antagonist role and ended up becoming something like a 10-year-old boy’s conception of everything that is awesome in the world. His brothers, Strong Mad and Strong Sad, were just what they sounded like. Coach Z was motivational, in his own weird way. The Cheat was basically Snoopy. It was a boys’ universe, designed by two men who sometimes seemed like overgrown kids themselves. (The series’ one significant female presence, Marzipan, is mostly notable for being The Girlfriend, though she gets some stories of her own as the site progresses.) What made it work was how open and earnest the whole project was. Nothing here was intended to be mean or downbeat. It was all happy and peppy and shot through with color and light. The Chapmans’ bright, shiny surfaces and colorful character design took what can be a weakness of Flash animation—the way everything seems to so easily boil down to a series of connected shapes, like in one of those “I can draw!” books—and made it a strength. The designs were simple, poppy, and instantly recognizable. Even better, the two loved to switch them up by twisting the characters into all manner of different visual styles, or dressing them up in ridiculous costumes for the yearly Halloween episode. Couple those appealing visuals with the well-defined characters and sneakily amusing scripts, and the two had a recipe for Internet success. Homestar Runner also showed something vital to the continued success of any serialized program: a willingness to evolve and adapt. Though Homestar Runner was the character whose name the website bore, the breakout character was unquestionably Strong Bad, who was a force of unrepentant id, his gruff voice (provided, as with almost all voices in the program, by Matt Chapman) and unusual appearance such an achievement that Matt Chapman intentionally reprised them for The Aquabats! Super Show!when he worked on that program. Though the site got some attention before Strong Bad began his long series of email responses—all to viewers who wrote in to prompt his responses—it was with the launch of his emails that the site truly took off. Indeed, the emails would eventually prove so popular they would be collected and published on DVD, something few web series then or since have seen happen. Any given email episode encapsulated the site’s relationship to its audience. Strong Bad was an antagonist, someone who would mock an email sender’s name or poor spelling, but he always did so in an affectionate manner. He was a playful bad guy, somebody who might have once hoped to win a Strongest Man In The World competition via cheating (hence giving his animal-like companion its name) but had now settled down in the series’ weird, pseudo-suburban universe to gripe about his neighbors and make fun of the stuff that crossed his computer screen. The email series became so popular not just because of Strong Bad but also because it allowed for the kind of instant interaction the Internet was so known for. It wasn’t TV, not precisely, with its remove and officiousness. It was something altogether different, where one might write in to a show and legitimately change its direction. Indeed, many of Homestar Runner’s most popular characters and even whole spin-off series emerged from particular Strong Bad emails. Throughout the series, there was always the sense the Chapmans knew exactly what they were parodying, lending the series an affection that played well after a stream of overly ironic cartoons meant to capitalize on the ground opened up by The Simpsons and Animaniacs but missed the mark by being too crass or mean-spirited. The Chapmans’ ability to keep an eye on what was popular—in real time, via web stats—meant that the Teen Girl Squad, the stars of a particularly popular Strong Bad email, received their own series. At the same time, the series offered up parodies of everything from old-time cartoons to anime that felt less like mockery or pandering and more like an attempt to imagine how the characters—particularly Strong Bad—might interpret pop culture the Chapmans’ world was steeped in. It’s been proven repeatedly that the Internet can make superstars of anybody, up to and including cats. But in the early days of Homestarrunner.com’s success, that was still very much an open question. The Chapmans weren’t the very first Internet creators to gain access to the wider, wilder world of pop culture, but they’ve arguably had the best track record at capitalizing on their initial success. They made music videos with They Might Be Giants and Of Montreal, under their filmmaking moniker The Brothers Chaps. They eventually scored a development deal with Disney, and Matt Chapman has lent his flair for good-hearted, goofy writing and the occasional voice performance to a number of the best kids shows of the era, including Aquabats and the terrific Disney Channel series Gravity Falls. All of this came at the expense of their original success. Homestarrunner.com is still active today, and the store—which provided the sole funding for the project, as the Chapmans refused to take advertising dollars and do to this day—remains open. But there hasn’t been a new cartoon since 2010, and once annual traditions, like the Halloween short (which grew more and more elaborate with every year), had even gone away by that point. The last Strong Bad email went up in 2009, and while Matt Chapman once suggested on a now-disappeared Twitter account that another will come someday, with every year that the site lies dormant and the Chapmans spread their particular brand of whimsy to the wider television world, a return seems less and less likely. But not impossible. The beauty of Internet television is that it never really has to go away, particularly when it’s a two-man show like Homestar Runner was. The Chapmans could roll out a new cartoon tomorrow and start updating the site all over again, and it would likely light up Twitter with nostalgia. Having nostalgia for something of the Internet era still feels a bit strange, since the ’net has been with most people for only 20 years or so. And yet Homestar and Strong Bad already feel of some other Internet era entirely, which may be why they’ve slipped into the past, without so much as a wrap-up video. Indeed, the Chapmans deliberately played off this sense of the series slipping into the Internet-that-was with this still frame of Strong Bad addressing a crowd at this year’s Comic-Con. Who makes Flash video files anymore? And doesn’t immediately port them to YouTube? And, on the flip side of that, wouldn’t Homestar Runner posting on YouTube just feel kinda weird? But think about it another way, and Homestar Runner is still all around us. It wasn’t the first series to get by on dorky earnestness, on believing that characters who were basically good-hearted and fun to be around could be the basis for a humorous show just as much as those drenched in cynicism and irony. It was pre-dated, notably, by SpongeBob SquarePants and a handful of other late ’90s hits. But Homestar Runner ended up feeling very like the purest possible expression of one corner of the Internet, the one that wanted to just like stuff, instead of always feeling at a remove from it. It codified the pureness of being a little kid and falling in love with your first TV show or movie or book, and it turned that into a series of web shorts that pointed the way forward not just for the legions of web series to follow but also a host of TV shows, from Adventure Time to Bob’s Burgers, from Community to Parks And Recreation. Did Homestar Runner influence all of those programs? Most likely not, but it tapped into something in the ether and heightened it. It created a goofy little community and daffy, surprisingly lovable characters to populate it, and it didn’t seem to break a sweat. It felt refreshing and new in 2002. That it feels less so in 2013 says less about the series’ staying power and more about how it seemed to realize something so many were thinking, even before they could speak the words that would make it be.